Direct from Woodyland, it’s Woody Aragon! 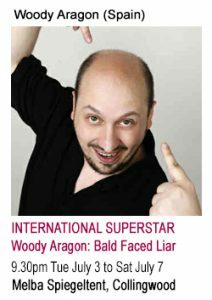 Woody Aragon is not just an outstanding card magician and technician he is above all an incredibly entertaining magical performer. Mr. Aragon has appeared on international television programs in Spain, Germany and the United States. He has just been nominated ‘Parlour Magician of the Year’ by Hollywood’s Famous Magic Castle. 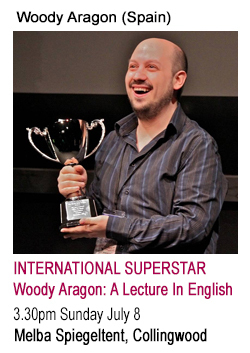 Woody will also present A LECTURE IN ENGLISH at 3.30pm on Saturday July 7 in the Melba Speigeltent. 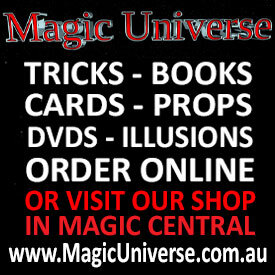 Theory about structure of tricks and shows. And, most of them, very easy to follow, to understand and to do! 1. 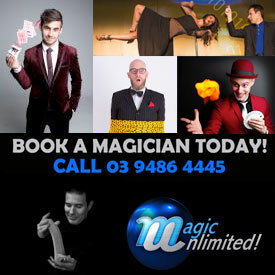 Being a gentleman magician – kind, the sort of person people would want to spend time with. 3. Bring emotion to his act. He certainly brought those 3 points together perfectly, we have seen some great lectures at The Fylde Mystics but at Woody’s lecture I have witnessed someone raising the bar to new levels. Spanish Magician Woody Aragón is amazing. We tried to think of a better superlative but were stumped. Imagine Winnie the Pooh braced against a tree tapping his little furry skull and murmuring “think, think, think.” That image fits both the writing of this review and witnessing the work of this great magician live at The Magic Apple Day of Lectures at the beautiful Sportsmen’s Lodge located in Studio City, California this weekend. Mr. Aragón began his lecture with one of the most impressive displays of card magic we have ever witnessed. We love to be fooled, really fooled. Mr. Aragón’s simple, charming approach to the presentation of magic fooled us so thoroughly that we immediately lost our ability to think like a magician. We no longer looked for technique or moves. We became fully engaged as an audience member – a lay person seeing magic for the very first time. As we have often noted in these pages, Oil and Water is an effect that seems to have run its course. It has been done, sold, demonstrated, taught and performed more often by often less than accomplished magicians than most any other trick. Mr. Aragón performed easily the most magical version of this effect that had – before this weekend – lost all of its magic. We feel some false assurance in our assumption that we know everything there is to know about everything. A subset of our omniscience is all magic sleights. We may not be able to perform anything more difficult than a riffle shuffle or a very loud and obvious pass, but we know about the moves. We can detect a second deal at fifteen paces and can tell you when a palm is about to occur. Yet, Mr. Aragón used very few sleights to accomplish his magic; and those he did use were well within our mastery. How, then, can he do what he did? How can he visually, slowly and repeatedly separate the reds from the blacks in a small deck of eight cards? And, more importantly, how can he cause the same separation of the remainder of the well-shuffled deck from which he borrowed those eight cards? At the end of his presentation, he began his lecture. This was one of the first lectures we have attended where we actually learned brand new ways of thinking and performing magic. Often we do not think or really perform when doing magic; at least not well and almost never at the same time. But Mr. Aragón’s lecture has made us a convert to this idea of thinking about the magic trick from the perspective of the audience and accomplishing what needs to be accomplished as part of a well-considered routine. His movements and interaction with the audience are casual and spontaneous. His reaction to tricks that have apparently failed or his volunteer’s misunderstanding of his instructions seemed genuine. Yet, like a great chess master, it was all part of a plan. Sure, we think about our performance and try to mystify through distraction and presentation but we had not taken it to the level Mr. Aragón has mastered. He is a delightful character on stage and wins the audience’s support with his charm all the while executing the very do-able manipulations to accomplish true miracles. We purchased his multi-DVD set and have set about to practice his routines. But unless we can also perfect our Spanish accent and learn to be charming, we will remain only an admirer of his talent. As competitive as we are, we are okay with just being a delighted fan of a great magician. It is a nice place to be. We are thankful to The Magic Apple for bringing us to this place.